Another proposed terminology is that described by Bruckner and Kahn, "A more descriptive term that explains the inflammatory traction event in the tibial aspect of the common leg in the runners is the medial periostitis of the tibial traction or simply the tibial periostitis medial"
Anterior: this compartiment contains the tibialis anterior muscle, the extensor hallucis longus, the extensor digitorum longus and the peroneus tertius. The tibialis anterior dorsiflexes the ankle and inverts the foot. The extensor digitorum longus extends the other toes and assists in eversion as does the peroneus tertius. B) Deep posterior: this contains the flexor digitorum longus, the tibialis posterior and the flexor hallucis longus. The tibialis posterior plantar flexes and inverts the foot. The others are predominantly toe flexors. C) Superficial posterior: this is the gastrocnemius and soleus group; predominatly plantar flexors of the ankle. Shin splint is a common overuse sports injury with incidence rates from 4% to 19% in athletic populations and 4% to 35% of military population. Shin-splints is most common with running and jumping athletes who made training errors, especially when they overload or when they run too fast for their potential. This injury can also be related to changes in the training program, such as an increase in distance, intensity and duration. Running on a hard or uneven surface and bad running shoes (like a poor shock absorbing capacity) could be one of the factors related to the casualty. Biomechanical abnormalities as foot arch abnormalities, hyperpronation of the foot, unequal leg length,.. are the most frequently mentioned intrinsic factors. Women have an increased risk to incur stress fractures, especially with this syndrome. This is due to nutrional, hormonal and biomechanical abnormalities. Individuals who are overweight are more susceptible to getting this syndrome. Therefore it is important that people who are overweight, combine their exercise with a diet or try to lose weight before starting therapy or a training program. These people, along with poor conditioned individuals, should always slowly increase their training level. Cold weather contributes to this symptom, therefore it’s important (even more than usual) to warm up properly. The pathophysiology is unclear but there are two hypothesis for discussion: periostitis induced by fascial traction or a local bone stress reaction. Internally a chronic inflammation of the muscular attachment along the posterior medial tibia and bony changes are considered to be the most likely cause of the medial tibial stress syndrome. The main symptom is dull pain at the distal two third of the posteromedial tibial border. The pain is non-focal but extends over “at least 5 cm”  and is often bilateral.It also worsens at each moment of contact. A mild edema in this painful area may also be present and tenderness on palpation is typically present following the inducing activity for up to several days. At first the patient only feels pain at the beginning of the workout, often disappearing while exercising, only to return during the cool-down period. When shin splints get worse the pain can remain during exercise and also could be present for hours of days after cessation of the inducing activity. The most common complication of shin-splints is a stress fracture, which shows itself by tenderness of the anterior tibia. Neurovascular signs and symptoms are not commonly attributable to MTSS and when present, other pathologies such as chronic exertional compartment syndrome (CECS) or vascular deficiencies should be considered as the source of leg pain. MTSS may overlap with the diagnosis of deep posterior compartment syndrome but the critical point for differentiation is the longer lasting post-exercise pain when compared with deep posterior chronic exertional compartment syndrome. Compared with stress fractures, the painful area extends over more than 5 cm on the distal two thirds of the medial tibial border. The following are two conditions that are sometimes mistakenly diagnosed as shin splints. Pain on the anterior (outside) part of the lower leg may be compartment syndrome: Swelling of muscles within a closed compartment which creates pressure. The symptoms of compartment syndrome include leg pain, unusual nerve sensations, and eventually muscle weakness. Making the diagnosis based on history and physical examination is the most logical approach. Physical examination If MTSS is suspected after the history: the posteromedial tibial border is palpated and the athletes are asked for the presence of recognisable pain (ie, from painful activities). If recognisable pain is present on palpation over 5 cm or more and no atypical symptoms are present, the diagnosis MTSS is confirmed. Type lll – chronic compartment syndrome. Imaging studies are not necessary to diagnose shin-splints, but when a conservative treatment fails, it could be useful to undertake an echo. If the injury has evolved into a stress fracture, an x-ray scan can show black lines. A triple-phase bone scan can show the difference between a stress fracture and a medial tibial stress syndrome. The MRI can also exclude tumors/edemas. Pain while performing sporting activities. The MTSS score specifically measures pain along the shin and limitations due to shin pain. Physicians should carefully evaluate for possible knee abnormalities (especially genu varus or valgus), tibial torsion, femoral anteversion, foot arch abnormalities, or a leg-length discrepancy. Ankle movements and subtalar motion should also be evaluated. Clinicians should also examine for inflexibility and imbalance of the hamstring and quadriceps muscles and weakness of “core muscles”. Core and pelvic muscle stability may be assessed by evaluating patient’s ability to maintain a controlled, level pelvis during a pelvic bridge from the supine position, or a standing single-leg knee bend. Examining patient’s shoes may reveal generally worn-out shoes or patterns consistent with a leg-length discrepancy or other biomechanical abnormalities. Treatment is predominantly conservative and there is no treatment proven to be effective for athletes. Therefore, temporary reduction or even cessation of the provoking activity is most frequently the initial response of the athlete and trainer alike to reduce the symptoms. Surgical treatment is rarely needed. It is indicated in the athlete who has failed one year's conservative treatment or in whom the condition is recurrent (two or more times). The surgical procedure consists in a deep posterior fascia release, to relieve tension or pressure commonly to treat the resulting loss of circulation, The described technique is an open procedure with fasciotomy by doing one or more incisions, of the deep posterior compartment, release of the ‘soleus bridge’, and resection of a periosteal strip from the involved medial tibia. Patient education and a graded loading exposure program seem the most logical treatments. Conservative therapy should initially aim to correct functional, gait, and biomechanical overload factors.Recently ‘running retraining’ has been advocated as a promising treatment strategy and graded running programme has been suggested as a gradual tissue-loading intervention. Prevention of MTSS was investigated in few studies and shock-absorbing insoles, pronation control insoles, and graduated running programs were advocated. Overstress avoidance is the main preventive measure of MTSS or shin-splints. 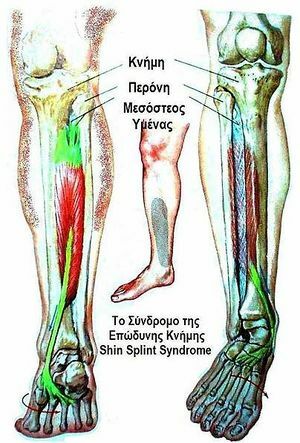 The main goals of shin-splints treatment are pain relieve and return to pain‑free activities. 2-6 weeks of rest combined with medication is recommended to improve the symptoms and for a quick and safe return after a period of rest. NSAIDs and Acetaminophen are often used for analgesia. Also cryotherapy with Ice-packs and eventually analgesic gels can be used after exercise for a period of 20 minutes. There are a number of physical therapy modalities to use in the acute phase but there is no proof that these therapies such as ultrasound, soft tissue mobilization, electrical stimulation would be effective. A corticoid injection is contraindicated because this can give a worse sense of health. Because the healthy tissue is also treated. A corticoid injection is given to reduce the pain, but only in connection with rest. The treatment should aim to modify training conditions and to address eventual biomechanical abnormalities. Change of training conditions could be decreased running distance, intensity and frequency and intensity by 50%. It is advised to avoid hills and uneven surfaces. During the rehabilitation period the patient can do low impact and cross-training exercises (like running on a hydro-gym machine).). After a few weeks athletes may slowly increase training intensity and duration and add sport-specific activities, and hill running to their rehabilitation program as long as they remain pain-free. Proprioceptive balance training is crucial in neuromuscular education. This can be done with a one-legged stand or balance board. Improved proprioception will increase the efficiency of joint and postural-stabilizing muscles and help the body react to running surface incongruities, also key in preventing re-injury. Choossing good shoes with good shock absorption can help to prevent a new or re-injury. Therefore it is important to change the athlete's shoes every 250-500 miles, a distance at which most shoes lose up to 40% of their shock-absorbing capabilities. In case of biomechanical problems of the foot may individuals benefit from orthotics. An over-the-counter orthosis (flexible or semi-rigid) can help with excessive foot pronation and pes planus. A cast or a pneumatic brace can be necessary in severe cases. Manual therapy can be used to control several biomechanical abnormalities of the spine, sacro-illiacal joint and various muscle imbalances. They are often used to prevent relapsing to the old injury. There is also acupuncture, ultrasound therapy injections and extracorporeal shock-wave therapy but their efficiency is not yet proved. ‘Shin splints’ is a vague term that implicates pain and discomfort in the lower leg, caused by repetitive loading stress. There can be all sorts of causes to this pathology according to different researches. Therefore, a good knowledge of the anatomy is always important, but it’s also important you know the other disorders of the lower leg to rule out other possibilities, which makes it easier to understand what’s going wrong. Also a detailed screening of known’s risk factors, intrinsic as well as extrinsic, to recognize factors that could add to the cause of the condition and address these problems. ↑ 2.0 2.1 2.2 2.3 Thacker, S. B., Gilchrist, J., Stroup, D. F., & Kimsey, C. D. The prevention of shin splints in sports: a systematic review of literature. Medicine & Science in Sports & Exercise. 2002; 34(1): 32-40. ↑ 3.0 3.1 3.2 3.3 3.4 3.5 3.6 3.7 Galbraith, R. M., & Lavallee, M. E. Medial tibial stress syndrome: conservative treatment options. Current reviews in musculoskeletal medicine. 2009; 2(3): 127-133. ↑ Pietrzak, M. Diagnosis and management of acute medial tibial stress syndrome in a 15 year old female surf life‐saving competitor. International journal of sports physical therapy. 2014; 9(4): 525. ↑ Winters, M., Bakker, E. W. P., Moen, M. H., Barten, C. C., Teeuwen, R., & Weir, A. Medial tibial stress syndrome can be diagnosed reliably using history and physical examination. Br J Sports Med.2018; 52(19): 1267-1272. ↑ 12.0 12.1 Beck B. Tibial stress injuries: an aetiological review for the purposes of guiding management. Sports Medicine. 1998; 26(4):265-279.